Roddes i'r arian i ti gynnau. beic "自行車" + y ferch "女孩" > beic y ferch "女孩的自行車"
canol "中心" + y dre "城鎮" > canol y dre "城鎮的中心"
cuiridh "將要放" cha chuir "將不要放"
òlaidh "將要喝" chan òl "將不要喝"
Ball, Martin J. & James Fife (ed.) (1993). The Celtic Languages. London: Routledge. ISBN 978-0-415-01035-1. Cowgill, Warren. 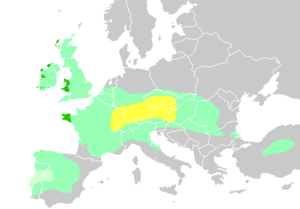 The origins of the Insular Celtic conjunct and absolute verbal endings. (编) H. Rix (ed.). Flexion und Wortbildung: Akten der V. Fachtagung der Indogermanischen Gesellschaft, Regensburg, 9.–14. September 1973. Wiesbaden: Reichert. 1975: 40–70. ISBN 3-920153-40-5. Forster, Peter and Toth, Alfred. Towards a phylogenetic chronology of ancient Gaulish, Celtic and Indo-European PNAS Vol 100/13, July 22, 2003. Gray, Russell and Atkinson, Quintin. Language-tree divergence times support the Anatolian theory of Indo-European origin Nature Vol 426, 27 Nov 2003. Hindley, Reg (1990). The Death of the Irish Language: A Qualified Obituary. London; New York: Routledge. ISBN 978-0-415-04339-7. Lewis, Henry & Holger Pedersen (1989). A Concise Comparative Celtic Grammar. Gottingen: Vandenhoeck & Ruprecht. ISBN 978-3-525-26102-6. McCone, Kim. The PIE stops and syllabic nasals in Celtic. Studia Celtica Japonica. 1991, 4: 37–69. McCone, Kim. Relative Chronologie: Keltisch. (编) R. Beekes, A. Lubotsky, and J. Weitenberg (eds.). Rekonstruktion und relative Chronologie: Akten Der VIII. Fachtagung Der Indogermanischen Gesellschaft, Leiden, 31. August–4. September 1987. Institut für Sprachwissenschaft der Universität Innsbruck. 1992: 12–39. ISBN 3-85124-613-6. McCone, K. Towards a Relative Chronology of Ancient and Medieval Celtic Sound Change. Maynooth: Department of Old and Middle Irish, St. Patrick's College. 1996. ISBN 0-901519-40-5. Russell, Paul (1995). An Introduction to the Celtic Languages. London; New York: Longman. ISBN 978-0-582-10082-4. Schmidt, K. H. On the reconstruction of Proto-Celtic. (编) G. W. MacLennan. Proceedings of the First North American Congress of Celtic Studies, Ottawa 1986. Ottawa: Chair of Celtic Studies. 1988: 231–48. ISBN 0-09-693260-0. Schrijver, Peter. Studies in British Celtic historical phonology. Amsterdam: Rodopi. 1995. ISBN 90-5183-820-4. ^ Hammarström, Harald; Forkel, Robert; Haspelmath, Martin; Bank, Sebastian (编). Celtic. Glottolog 2.7. Jena: Max Planck Institute for the Science of Human History. 2016.